I just have one teeny tiny issue with Andrea Nguyen’s seriously wonderful Vietnamese cookbook, Into the Vietnamese Kitchen– I’d love to see more pictures! Especially because she has so many unique recipes that I haven’t seen in other cookbooks or food blogs… and there’s nothing like an amazing picture of a prepared dish to inspire me to get cooking. 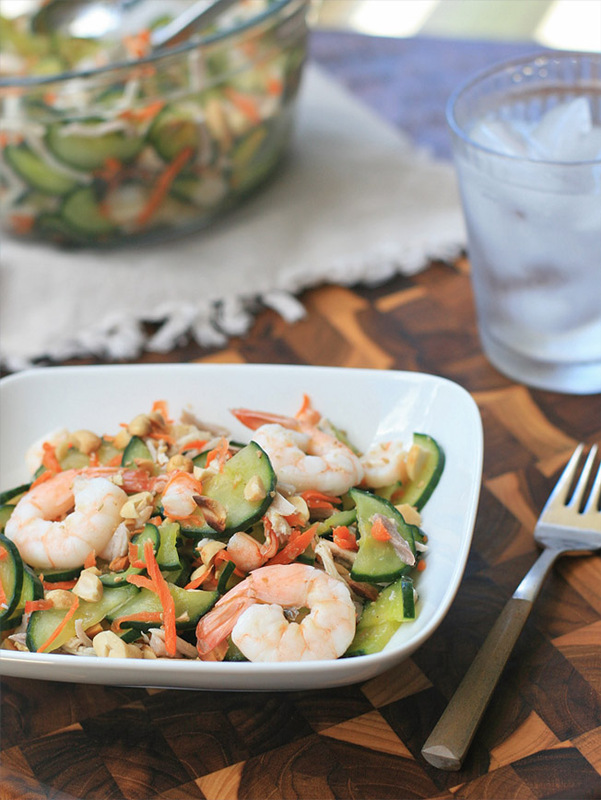 This cucumber and shrimp salad was one of those recipes that I hadn’t seen in any other of my other favorite Vietnamese cookbooks, but since it sounded like a perfect one-dish summer meal so I was eager to give it a shot- even more so after I read Andrea’s headnote that her mother had made it for her wedding reception. Just like everything else I’ve made from Andrea’s cookbooks, this one didn’t disappoint. I was initially worried that it would be a tad bland, since it didn’t contain any fresh herbs. How wrong I was. The salad is colorful and filling, with plenty of contrasting flavors and textures. 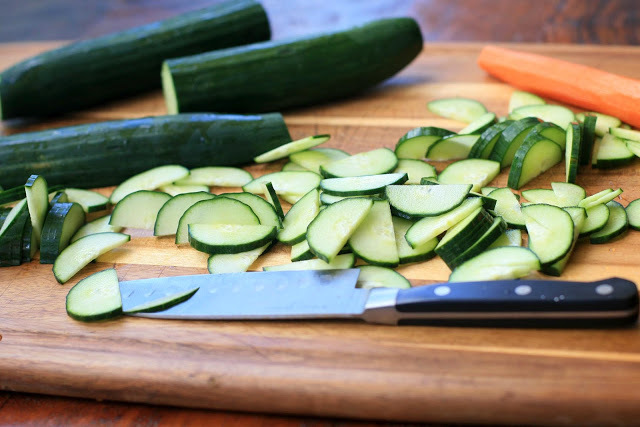 The main base of the salad is vegetables like cucumbers and carrots, but there’s plenty of richness from the fine shreds of chicken and pork. 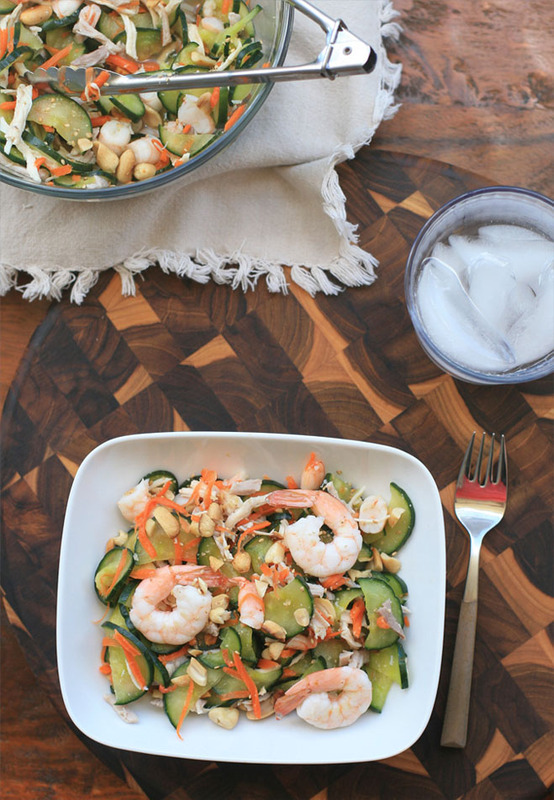 Although this salad does take some time to put together, I’m really excited to share it because it doesn’t use any hard to find Vietnamese herbs or ingredients that probably aren’t available where 95% of you live. So if any of you have been involuntary sidelined from the Vietnamese salads I’ve been featuring lately I urge you to give this one a shot. You won’t miss that rau ram one bit. 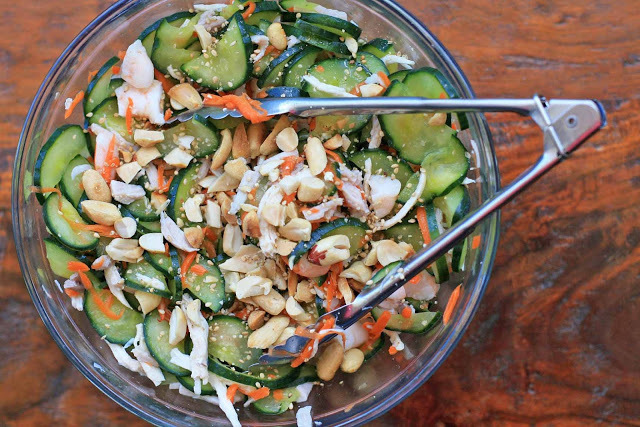 In a large bowl combine the cucumbers and shredded carrot. Add the salt and the sugar and toss to evenly distribute the salt and sugar. Set aside for 30 minutes. 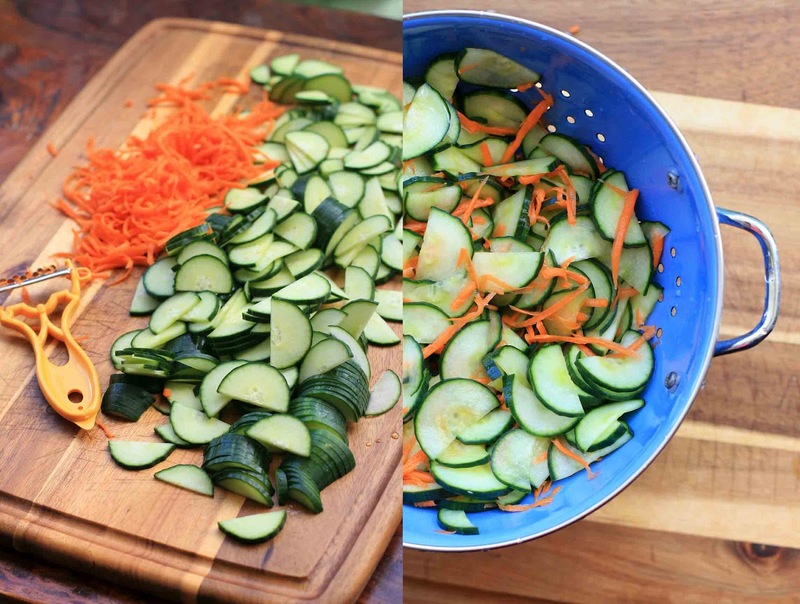 Transfer the cucumbers and carrot to a colander and rinse thoroughly under cold water. 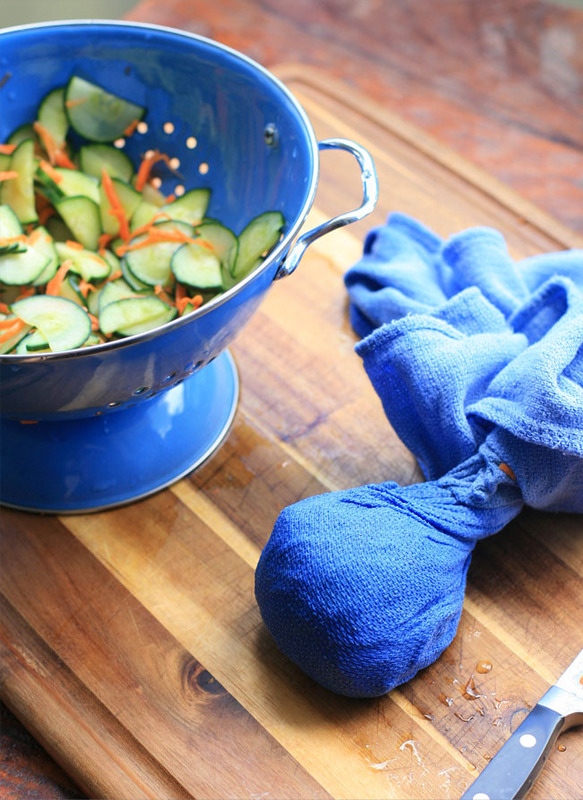 Working in batches, take some of the cucumber and carrot mixture and plop it into the center of a clean, non-terry dishcloth (several layers of cheesecloth would probably also work). Twist the ends so that the cucumber and carrot mixture is forced into a tight ball. Use your hands and squeeze the mixture several times to wring out moisture. Transfer the mixture to a large bowl and repeat with the remaining cucumbers and carrots. Fill a medium saucepan halfway full with water and bring to a boil. Drop in the pork chop and chicken. Return to a boil and then reduce heat and simmer gently until they are both cooked through. Remove the chicken and pork from the water and let cool. Reserve the light stock for another use or drain. When the pork and chicken are cool enough to handle, use your hands to pull into shreds. Let them cool completely and then add to the cucumber and carrot mixture. 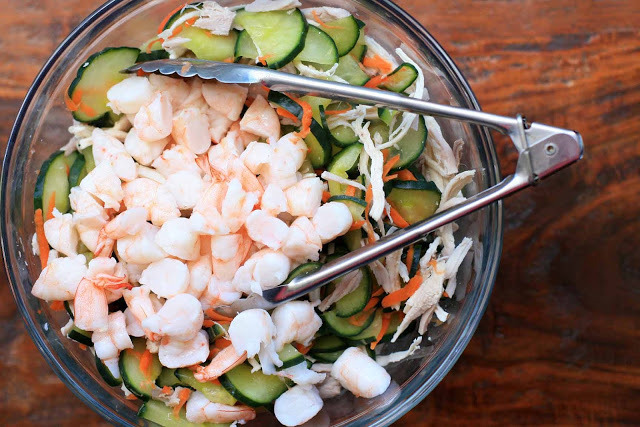 Add the shrimp and the toss everything together. Make the dressing by combining the lime juice, sugar, fish sauce, water and chile peppers. Pour onto the vegetables and toss well. Sprinkle the mixture with peanuts and the crushed sesame seeds. Serve immediately.